It does not only involve “shrinkage” however, but major crime. 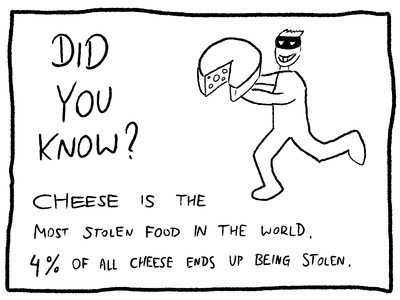 Recent reports worldwide include: Time on Operation Wine and Cheese, a sting operation in Italy to apprehend thieves of 168 wheels of Parmesan; NBC on cheese pirates who hijacked a truckload of 20,000 pounds of cheese in Wisconsin; not to mention cheese burglars in rural France. ¹Global Retail Theft Barometer (2011, 5th edition), Centre for Retail Research, Nottingham, UK. ² Sutton, M. (2010). Product design: concealable, removable, available, valuable, enjoyable, and disposable (craved), and value, inertia, visibility, and access (viva). In B. S. Fisher & S. P. Lab (Eds. ), Encyclopedia of victimology and crime prevention (pp. 673-676). Thousand Oaks, CA: SAGE. doi: 10.4135/9781412979993.n225.